24 hours later, we are still laughing. Lauren Yee's "King of the Yees" is brilliant, innovative and self-deprecating while fiercely proud at the same time. It is also very, very funny, with sequences that are nothing short of side-splitting. You don't have to be San Franciscans to appreciate all the nuances of this show -- but, hey, we are! 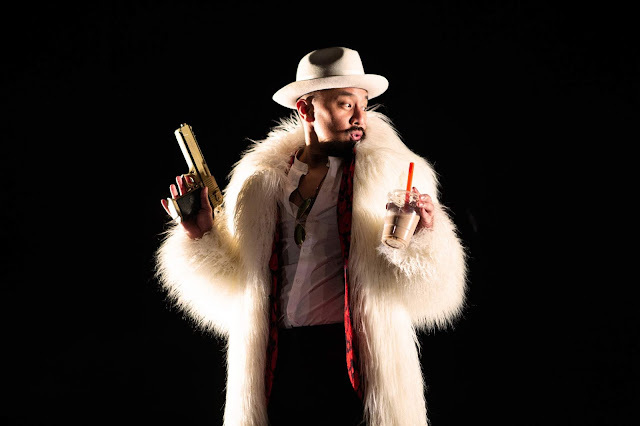 Shrimp Boy in the white mink and all-white theater audiences and Chinese parents demanding grandchildren and don't forget the Jews. The show skewers every nationality so hard it could probably be on Fox, if there were anything fake about it, which there isn't, and if it weren't so sympathetic and heartfelt about all cultures. 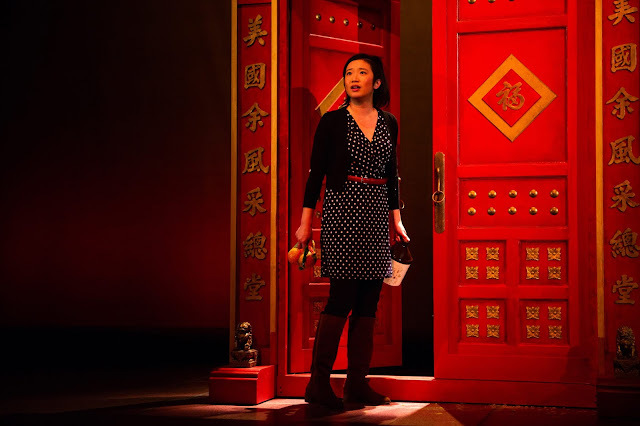 But...she hasn't bothered to tell her dad that the play is about him, or that this is basically his daughter's good-bye to Chinatown and, by extension, to her Chinese heritage. Then, Larry comes to rehearsal. 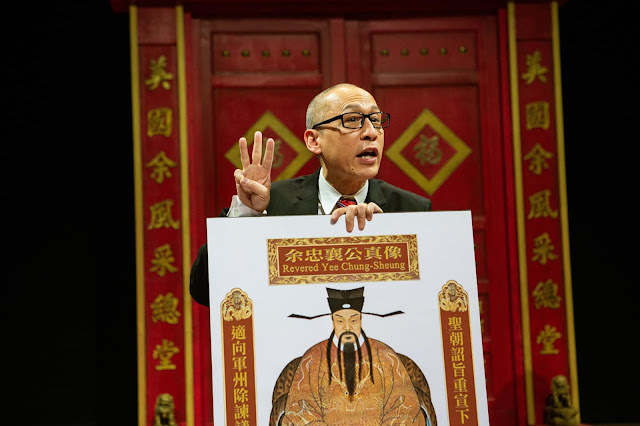 Get ready for brilliant actors playing multiple parts, and parodies of Chinatown traditions such as lion dances and a liquor store where they sell "the good, cheap stuff." Don't forget the Lum Elders. God, no. 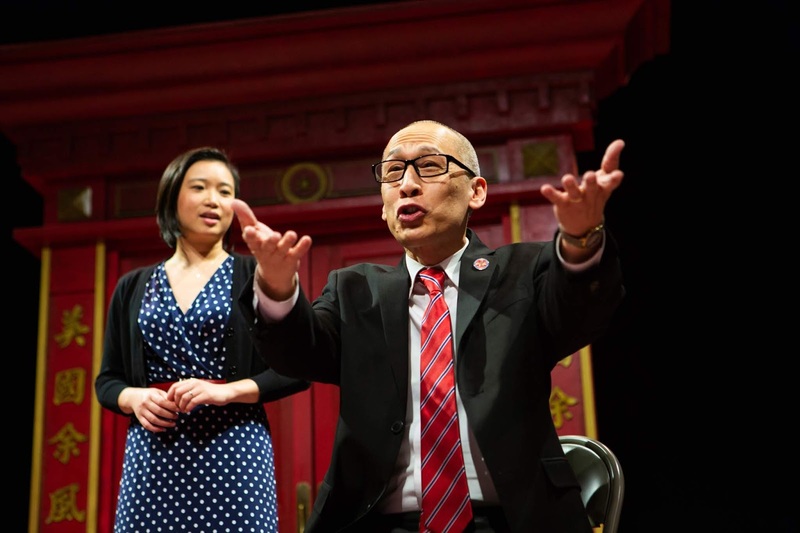 Each actor has room to steal this show, including Actor 3 (Will Dao), who comes out of the audience to play several terrific roles, including the dancing lion and a Lum elder. If someone that wasn't Chinese had written this show, it would probably get skewered for insensitivity. But she is, and she's allowed. 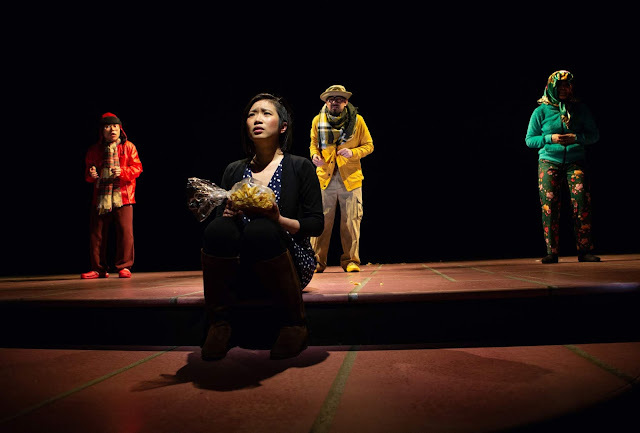 "King of the Yees" is a terrific, satisfying production that in the end is all about a girl trying to talk to her Dad. OK, yeah. The ending's too long. The other Bangle is for the way this show makes me laugh, un-self-consciously, at all the trappings that every culture considers sacred. Come on, people. In the end it always comes down to Mom and Dad. "THE KING OF THE YEES"
Dan Hoyle's 2006 tour de force "Tings dey Happen" took us to the oil fields of the Nigerian Delta. 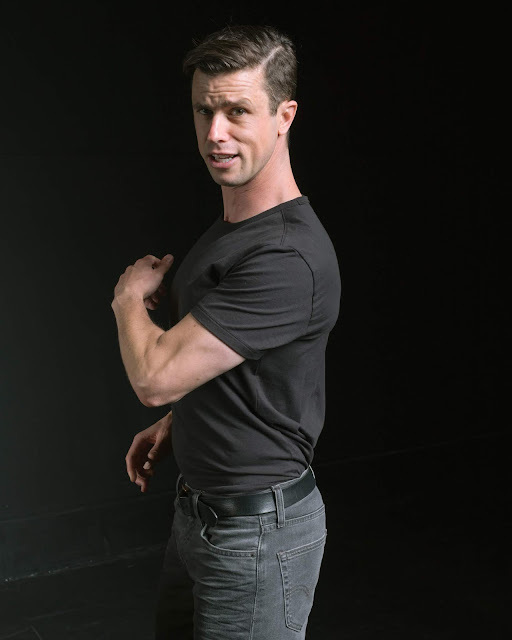 Written and performed brilliantly in spot-on Pidgin English, Hoyle presented a world to us that we had never seen before, about which we knew little. Since then, he has been traveling through America and writing about us. Sadly, we know a lot about this stuff. Hoyle's observations always ring true and they can be painful. Fourth of July, and López, a border patrol agent who longs to do comedy. The format of the show is one long-ish vignette about each character, followed by lights down and a few bars of music, leading to lights up and the next vignette. We loved Larry and López. We felt for the lady who had come from Iraq and was embarrassed to eat chocolate cheesecake. 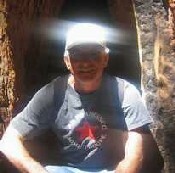 We applauded the gay hermit/rancher in Southern Arizona who helped illegal immigrants when they showed up at his door. We were very impressed that Dan Hoyle speaks such excellent Spanish, especially after watching Mike Pence mumble incoherently about Venezuela. 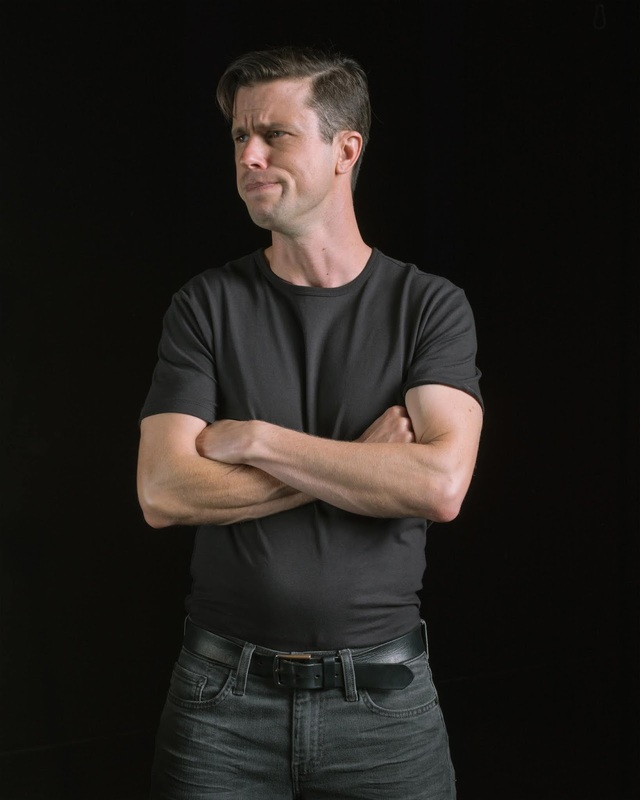 With each new Dan Hoyle show we have a similar wish, which is that his characters would interact with each other, or at least have the narrator play a larger role. We love most of his characters, but we search for the center. Perhaps Dan Hoyle, a young man who travels around the country gathering information from people to put into a stage show -- could be featured in one of his vignettes. I'd like to see how López would handle the interview. 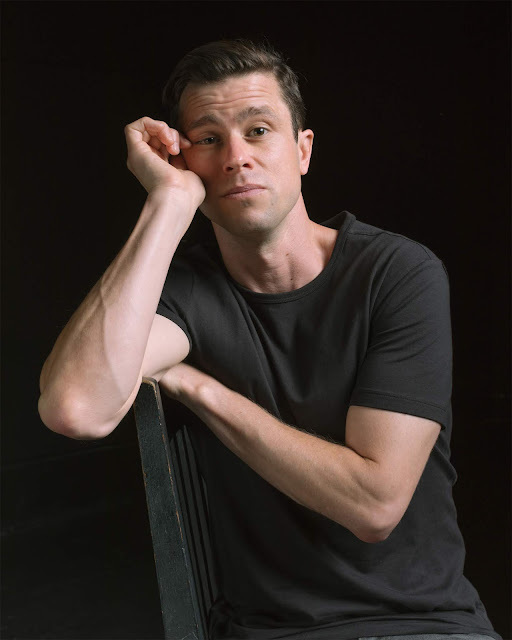 We never miss a Dan Hoyle show, and neither should you. He is unique. Also, we love his songs from previous shows. We can always use a little more guitar, sir. 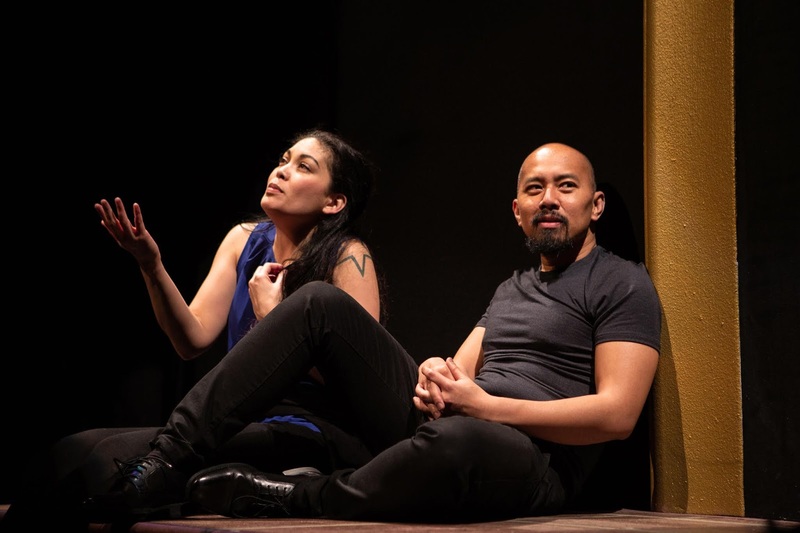 With respect for seldomly-observed digital honesty, The San Francisco Theater Blog must admit that the Hoyles live on our block. You may take that into consideration when observing this rating for "Border People:" THREE STARS WITH A BANGLE OF PRAISE. Dan Hoyle's performance, the music and lighting, and the concept itself earn One Star each. The BANGLE is for Hoyle's comment about the Permanent Residency Card, which turns out to be neither permanent nor residential. And as López the border agent says, "We have to keep the door open, but how far can we open it?" López and Hoyle have defined America's problem. Now, what do we do about it? There are many wonderful things about Steven Anthony Jones's solo performance of August Wilson's final play. 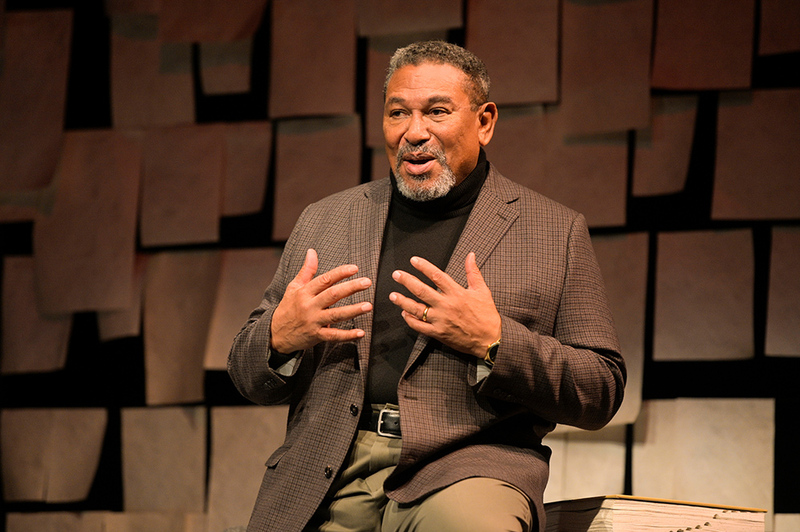 Wilson himself performed the role first, two years before his death in 2005, and Jones channels the great author as he talks about his life as a young man growing up in the Hill District of Pittsburgh. We particularly loved the Wilsonisms, the wry and poetic asides that pepper every August Wilson play, such as a white man approaching the author at a party to say, "I don't see color." Wilson asks the man if he said the same thing to that white man over there, or that white man over there. When the first person says, "No," Wilson asks him, "...then, if you don't see color, why did you say that to me?" 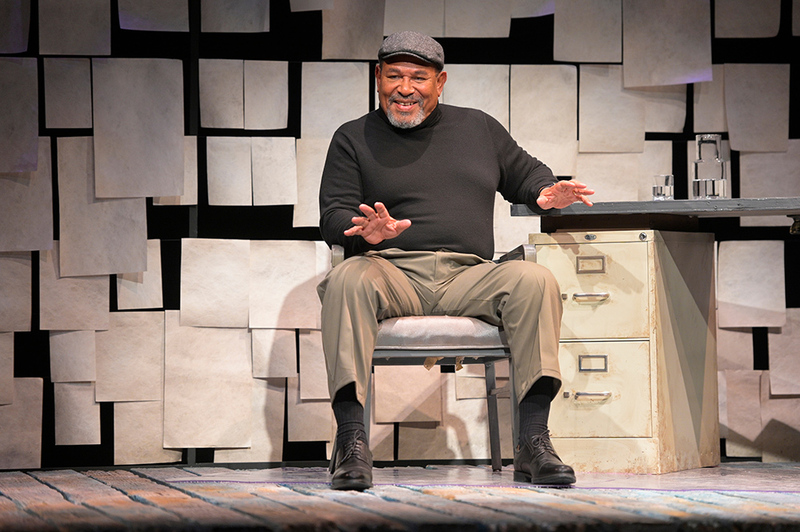 Each character taught August Wilson a valuable lesson. His mother taught him to never settle for less than he is worth. His friend Cy Morocco taught him to dream as high as he wished but be ready to perform when opportunity strikes. Perhaps the biggest laugh of the night was when the author tried to make more money from a 16-line poem by turning it into 32 lines. Clearly, there were writers in the audience. Jones does not try to assume the personalities nor physical attributes of each character, as a solo performer might. 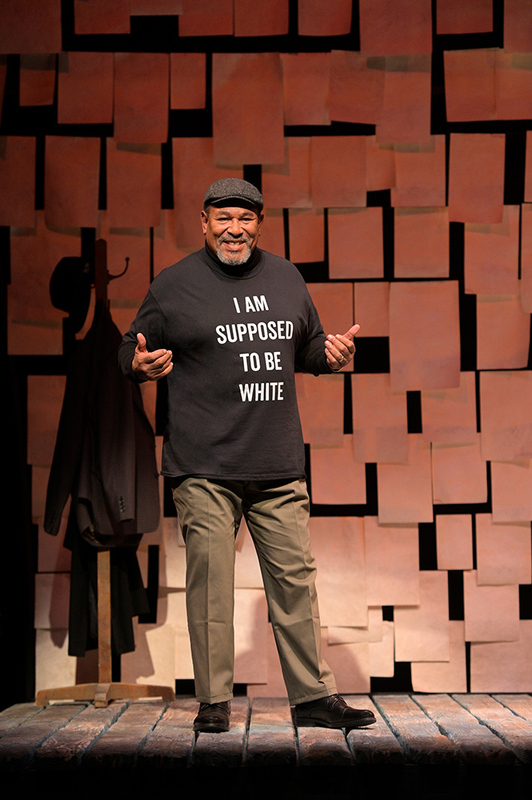 Instead, we never lose sight of August Wilson, the older man looking back on his youth. It is a one-man play, and therefore it all comes down to that one man. On Opening Night Jones was personable and accessible, but he also stumbled and mumbled, forgot lines and clearly missed critical sequences. When he was good he was very good, but when he was not the show dragged to an inconclusive ending. The good thing is that this show is co-sponsored by the Lorraine Hansberry Theater and the Ubuntu Theater Project. After the run at Marin Theater Company, the show will continue in smaller venues. We shall see it again then when all the pieces should be in place. The San Francisco Theater Blog awards "August Wilson: How I Learned What I Learned" Three Stars. We expect that the show's rating will rise as the run continues. 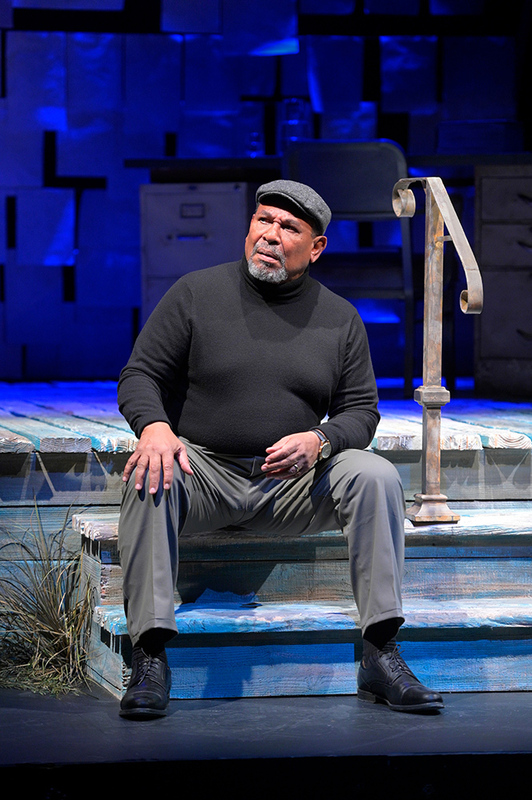 "August Wilson: How I Learned What I Learned"